This article will discuss the occupation of the Institute of Social Sciences (ISW) at Humboldt-Universität zu Berlin (HU) with a focus on how students at the Institute positioned themselves with respect to the accusations against Andrej Holm. But first, what was the nature of the accusations and why were they made? From September 1, 1989 to January 31, 1990, Andrej Holm (academic staff for urban studies at HU) was ”Hauptamtlicher Mitarbeiter” in training with the East German Secret Service (Stasi). After reunification, he became active in the squatting scene in Berlin and began studying social sciences at HU (1990-1997). His dissertation (2004), which dealt with aspects of gentrification in the Berlin neighborhood of Prenzlauer Berg, made him one of the most important scholars and experts in the field of social inequality in the city. In 2016, the left-wing party DIE LINKE wanted to use his expertise and named him State Secretary for the newly inaugurated Berlin Senate. 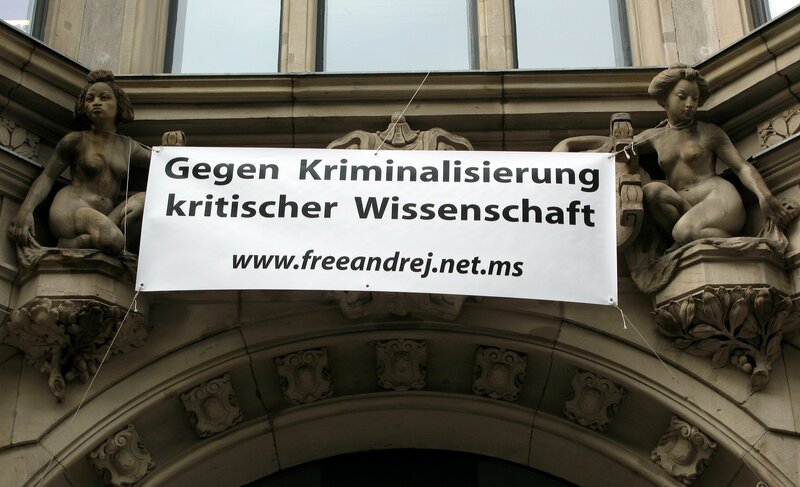 Copyright Anne Grieger, Protest gegen Inhaftierung des Soziologen Andrej H.
During the nomination process, however, Holm’s involvement with the Stasi became a media topic, starting with the fact of his involvement and then moving on to the way he handled his past when filling out his personal information when he started his job at HU. Due to public pressure and a request for his resignation from Social-Democratic Berlin Mayor Michael Müller, Holm resigned from the position in January 2017. At the same time, HU looked into whether or not his statements should also lead to his dismissal from his job and on January 18, 2017, the president of the university announced that Holm was being fired. In direct response, 200 students and activists occupied the ISW). Being members of the institute as students and employees, during the occupation, we found ourselves oscillating between solidarity, responsibility to our instructors and colleagues, missed chances to get involved, alliances and gainful employment. While the occupation was underway, we mostly tried to engage by organizing events on topics that were related to the issue or participated in discussions and talks. The media, however, portrayed the students as naïfs who did not know what they were talking about with regard to the Stasi, the GDR and the “Unrechtsstaat” (a derogatory, post-reunification term for the East German “unjust state”). One critique that kept appearing in the comments was that the students were displaying naïve, uniform solidarity with a former member of the Stasi—that they were left-wing extremists who had learned nothing from the past and were therefore ridiculing the victims of the GDR. But a closer look at the events and the students’ involvement reveals a different image. A roundtable discussion organized by the Robert Havemann Foundation in January was well attended by ISW students. In our opinion, most of the students who attended wanted to hear directly from Holm regarding how he would position himself and what he had to say about the accusations. There was a heated discussion as to whether to accept his statements or to believe historian Ilko-Sasch Kowalczuk, who argues that Holm had not forgotten his past but rather did not want to remember, and what doing so would mean for Holm’s integrity and students’ trust and faith in their assistant professor. The students’ desire to engage in that discussion was not met that day (they were made to wait outside for a long time) and the university did not initiate a discussion in the weeks that followed. As a result, students from the ISW and other institutions both within Humboldt and at other Berlin universities initiated discussions outside official university spaces. At no time was there just simple partisanship. Instead, we had exchanges about the GDR that felt rewarding, given that students had occasionally discussed the Institute and Humboldt University’s GDR legacy and that the ways that GDR ideology had shaped scholarship at Humboldt University had been addressed rarely and only through the engagement of a few people. Students and colleagues with whom we had usually discussed contemporary politics, exams, the conditions of academic employment or bars in the Berlin’s Neukölln neighborhood suddenly started to talk about their own or their parents’ lives and the related questions of identity. How much of the GDR have we inherited through our parents? At a historical moment when the state is drawing new borders between people of different origins, students were discussing the circumstances under which their parents found the courage to resist, escaped or invented ways to get their needs met. And how much courage do we show by comparison? We wondered how we could make these stories—our stories—more accessible to us and how we could come to terms with our own past. Is it enough to only engage with our own family history? How can we gain access to our parents’ Stasi files and what purpose would doing so serve if the people who were affected cannot talk about how they experienced it and what for them seems true or false when reading those files? What else needs to be known and researched? What would a critical analysis of the Marxist-Leninist history of the Institute look like? We are the children of SED (Social Democratic Party) members, Stasi informants, civil rights campaigners, convicted political refugees and correspondents; West Germans, East Germans and migrants with more than one passport and identity; parents and children who grew up in different states where they were also recognized differently. Those few days marked the first time we recognized the similarities we all share through our experiences with the GDR. Yet it also became clear how differently we all perceive our world and our environment as we discussed why it is so important for some of us to call the GDR an Unrechtsstaat while others feel that such a classification misrepresents the GDR and delegitimizes their own family history. One thing we have in common is that none of us want to legitimize or glorify the wall’s death toll, the prisoners or the arbitrariness of the state. The simple comparison of Unrechtsstaat und Rechtsstaat, however, easily leads us to a rash assignation of the FRG (Federal Republic of Germany) as a Rechtsstaat that also glorifies a nationalistic perception of the FRG. It also silences unconstitutional paradoxes, exclusions and the discomfort and critique of such comparison. The students developed ideas for new term papers and theses regarding questions of identity and statehood and interdisciplinary dialogue and cooperation projects. So, is it true that we and the students of the ISW do not know what the GDR was like? That may be so. We have a lot of questions. We and the students know that our knowledge is situated and that experiences shape our perception. We occupy a white perspective and racist and colonialist ideas structure our thinking. Critically questioning our own thinking pattern is an ongoing process. That is why we reject simplified arguments that suggest continuity without ruptures—such as between the young man who once worked for the Stasi and the person who is Andrej Holm, scholar and State Secretary who has ideas for monitoring the real estate industry using the existing laws. We reject the sweeping condemnations of people who spurn public debate or are dismissive of protests against the nearly incomprehensible, legally thin reasoning behind a dismissal that, moreover, misses the point of academic integrity and honesty. With the help of both a critical methodology and the teaching scholars at the ISW and other institutions, we have learned nuanced and critical ways of examining individual biographies and historical placement in terms of both individual and collective memory. The study taught us to critically analyze political and administrative decisions in different political systems. Democracy theories, the vulnerability of state power and the danger of populist movements are all part of the curriculum. We learned to analyze facts before passing judgments. Taking a closer look at the “university from below” program, one has to acknowledge that coming to terms with the GDR as a political construct has become a main focus. It shows a willingness to critically confront the ruling system of the GDR and to make well-informed (rather than generalized) assessments of lived experiences such as those of Andrej Holm. We know that a complex question needs to be understood in its context and that the answers we find are more likely to raise additional questions than to generate easy answers. By failing to note explicitly that he had worked as a ”Hauptamtlicher Mitarbeiter” Stasi employee, Holm did not provide accurate information on his position within the organization when the university hired him in 2005. The question of the usefulness of such questionnaires in the retrieval of East German biographies has only been a matter of peripheral discussion and cannot addressed here due to limited space.